Beyond Retro, the leading European vintage retailer, and parent company Bank & Vogue, are excited to be closing the loop with an innovative project in partnership with Swedish chemical recycling company re:newcell, that will turn post-consumer denim into a new, recycled fibre at industrial scale. Beyond Retro’s parent company, Bank & Vogue is one of the largest traders in used apparel in North America, and operator of the largest commercial re-manufacturing facility in the world in India. They are leaders in the circular economy of textiles with over twenty years of experience in the ReUse space. Offering a completely unique perspective, honed from their expertise in trading, retailing, remanufacturing and recycling used clothing, Bank & Vogue is the only full circle global solutions provider in the reuse world of the apparel industry. “We’re excited to partner with Beyond Retro to recycle worn-out jeans into a pristine raw material for the fashion industry. This collaboration brings together the expertise needed to prove that truly circular fashion, from reuse to recycling, finally works.” said Mattias Jonsson, CEO of re:newcell. 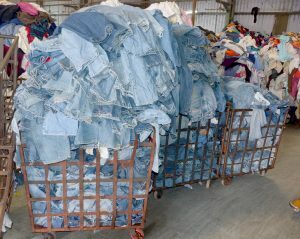 “The precious material in 90 000 pairs of jeans can now be recovered and made into clothes once again, saving massive amounts of CO2, freshwater and chemicals”.